My kids are in love with breakfast cereal. And not the healthy kind, either. They LOVE their sugar-filled boxed cereal! My problem is that it is about as filling as cotton candy…They eat bowls and bowls of cereal, and then 10 minutes later they are complaining that they are hungry again! And this busy mom only serves breakfast once a day. There are no Second Breakfasts, Elevenses, Half-Noonsies, etc. at my house, much to my kids’ dismay. I have been very, very lucky that all of my kids have liked oatmeal, which is incredibly filling and great for getting fiber. But who wants a bowl of hot oatmeal for breakfast in the summer?? Yeah, I don’t blame them. So we do the next best thing – we make peanut butter granola! Have you seen the price of granola at the store lately??? It’s enough to give you a heart attack! I still struggle to understand why eating healthy has to be so expensive! Don’t get me wrong, we’re no health nuts here at our house. I like the idea of eating healthy, but the reality of implementing such novel ideas with picky eaters has been beyond frustrating. So I try to pick my battles. This is one I can easily win. My kids (and husband) gobble this stuff up!! I mean like it’s going out of style faster than the lastest junior high fad (although seriously, bottle flipping couldn’t die out fast enough for this momma). One of the best things about this stuff, beyond being easy to make, is that you can make a huge batch, in about the same time as a single batch, and you can store extra bags in the freezer to pull out when needed! Not that we really ever have extra, even when I make double or quadruple the recipe. But I don’t like to be tied to my kitchen with a long list of items I need to make up each week. So I make large batches and hide some away in the freezer. If I’m careful, I can sometimes get our stash to last us two, maybe even three, weeks. My family loves this stuff just as is, but sometimes it’s nice to change things up, you know? I’ve found that there are plenty of easy things you can do for variety. The top choice is to add in fresh fruits. The kids love berries of all kinds in theirs! But those can get expensive during the winter months, so we sometimes go with other alternatives. 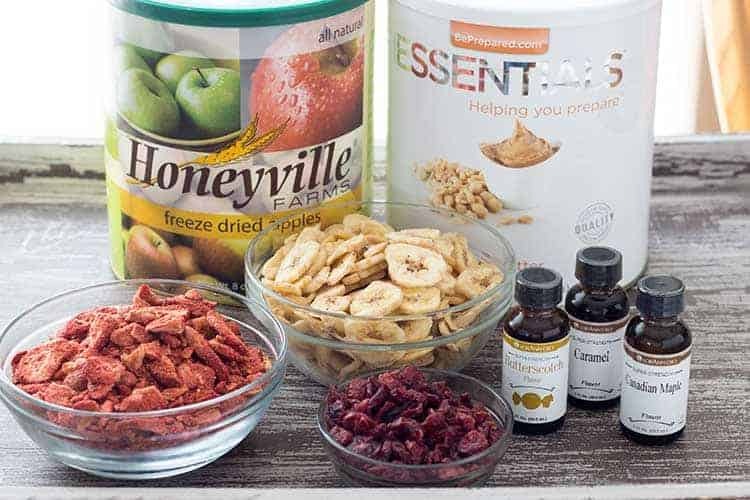 Some of our favorites are adding in flavoring oils (caramel, butterscotch or maple), nuts (almonds, peanuts) and/or incorporating dried or freeze-dried fruit (Craisins, freeze-dried sliced strawberries or apples, even honey-coated bananas). My husband’s favorite way to customize it is with the caramel flavoring oil and freeze-dried banana slices. He calls it his Bananas Foster Granola! I’m lucky and live in a state where there are several big-name food storage companies around, and I can find these items in local stores. But if you are in an area where these items are not commonly found, follow the links above to find them online. One other change we sometimes do is to make the recipe with peanut butter powder instead of the regular jarred stuff. I can get large cans of peanut butter powder from a local food storage company, but you can find smaller containers in most grocery stores nowadays (PB2 or PBFit are the two biggest brand names, although Walmart also carries a store-brand version now, too). I’ve even seen it pop up in warehouse stores as well. I just find it so much easier to work with than scooping the other stuff out of the jars. (I do a straight substitution and have found that I don’t need to add any additional liquid when using the peanut butter powder, but play around with it and see what works best for you.) If you really want to kick it up a notch, try the chocolate peanut butter powder – yummy!!! There are so many great ways you can dress this peanut butter granola up, or just eat it plain. The sky’s the limit! But no matter what, I promise you’ll find this a lot more filling than those other cereals, and hopefully maybe even slightly better for you, too!! 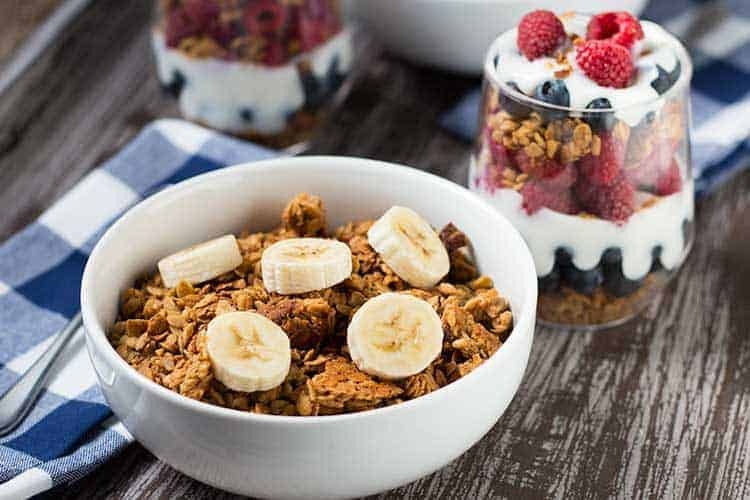 Making your own granola cereal is easy, and it's so much cheaper than store-bought! An easy, healthier breakfast cereal option without too much extra fuss! Combine first four ingredients in saucepan over medium heat until melted and combined. Bring to a boil and boil for one minute. Remove from heat. In large bowl, combine oats and grain cereal. Pour in peanut butter mixture, then cinnamon and vanilla. Stir to combine. Spread granola mixture out evenly on a baking sheet. Bake at 350 degrees Fahrenheit for 25-30 minutes, being careful to watch around the edges of the pan for scorching. Remove from oven. 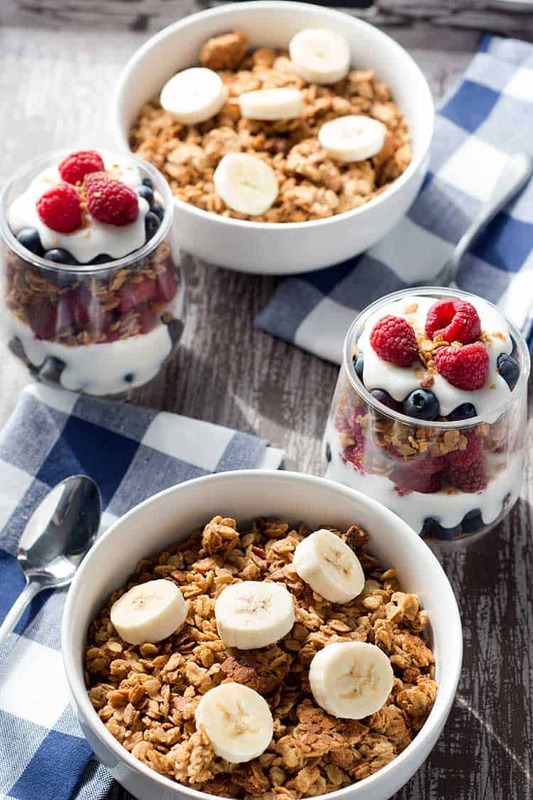 Let cool for 15 minutes, then use a large spoon or spatula to gently break granola up into small clumps. Store in an airtight container, or place in gallon-size freezer bags and freeze for later use. Make-Ahead Best Ever Cornbread Mix – Two Ways!